STAGG UNIVERSAL MULTI GUITAR STAND CASE - HOLDS 8 ELECTRIC or 4 ACOUSTIC GUITARS. STAGG UNIVERSAL GUITAR STAND CASE, UP TO 8 ELECTRIC OR 6 ACOUSTIC GUITARS. 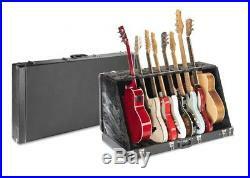 Universal guitar stand case for up to 8 electric or 6 acoustic guitars. Featuring a traditional hardshell case w/ plush interior, black vinyl finish, ideal for stage and studio. Size when closed: 108 x 53 x 13 cm (42.6 x 20.8 x 5.1''). Fits up to 6 electric or 3 acoustic guitars. Dimensions when closed: 42.6" L x 20.8" W x 5.1'' H.
Construction: Traditional hardshell case w/ plush interior. Exterior Cover: Black vinyl finish. Use: Ideal for stage and studio. A customer RA number must be issued before we can except any return. The item "STAGG UNIVERSAL MULTI GUITAR STAND CASE HOLDS 8 ELECTRIC or 4 ACOUSTIC GUITARS" is in sale since Wednesday, May 9, 2018. This item is in the category "Musical Instruments & Gear\Guitars & Basses\Parts & Accessories\Stands & Hangers". The seller is "andreasinc" and is located in Palm Harbor, Florida. This item can be shipped to United States, Canada, United Kingdom, Denmark, Romania, Slovakia, Bulgaria, Czech republic, Finland, Hungary, Latvia, Lithuania, Malta, Estonia, Australia, Greece, Portugal, Cyprus, Slovenia, Japan, China, Sweden, South Korea, Indonesia, Taiwan, Thailand, Belgium, France, Hong Kong, Ireland, Netherlands, Poland, Spain, Italy, Germany, Austria, Bahamas, Mexico, New Zealand, Philippines, Singapore, Switzerland, Norway, Ukraine, Croatia, Malaysia, Brazil, Chile, Colombia, Costa rica, Panama, Trinidad and tobago, Guatemala, Honduras, Jamaica, Antigua and barbuda, Aruba, Belize, Dominica, Grenada, Saint kitts and nevis, Saint lucia, Montserrat, Turks and caicos islands, Barbados, Bangladesh, Bermuda, Brunei darussalam, Bolivia, Ecuador, French guiana, Guernsey, Gibraltar, Guadeloupe, Iceland, Jersey, Cambodia, Cayman islands, Liechtenstein, Sri lanka, Luxembourg, Monaco, Macao, Martinique, Maldives, Nicaragua, Peru, Pakistan, Paraguay, Viet nam.